The German engineer and master builder—Johann Helfrich Müller (1746-1830) (see biography of Johann Müller) is a very interesting figure in the world of mechanic calculators, not only for his small calculator, an improved version of the machine of Philipp Hahn, which he created, but for his plans to build a difference engine almost 40 years before Charles Babbage. He also wanted to built a machine, that was capable of being configured to use Leibnitz's arithmetica dyadica. Johann Müller was a creative mind and started to make inventions from the beginning of 1770s. Firstly he created a theatre, equipped with optical and mechanical effects for the children of his boss—Prince Georg Wilhelm, later on he designed a large and powerful burning mirror, as well as other devices. In the beginning of 1780s Müller was asked by the local superintendent's office to check and recalculate some tables relating to the volumes of trees. To shorten this task he had come up with the idea of a machine for the purpose. Soon he realized however that with a few small changes, he could get the machine to perform subtraction, division and multiplication as well. Most probably, at that time he came across an article (probably that in the magazine Teutschen Merkur) about the calculating machine of his compatriot, Philipp Hahn, which de decided to use as a prototype, and to try to improve somehow. Interestingly, later in middle 1780s Müller was accused by Hahn for stealing his design, but flatly denied accusations, although comparing the machines of Hahn and Müller (they are as like as two peas), it is hard to believe, that the latter didn't use at least the basic design of his predecessor. 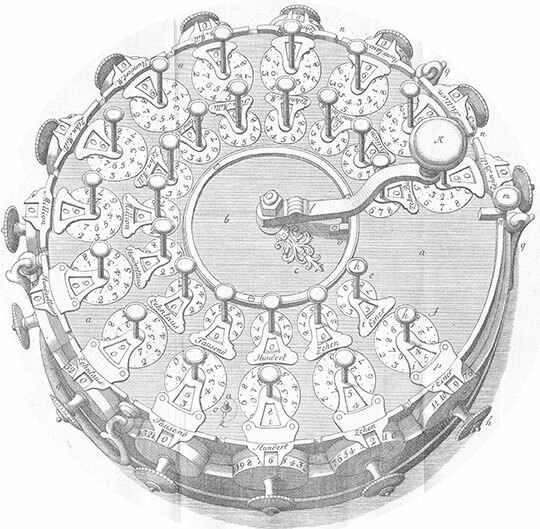 After about three months of designing, in June, 1782, the project was ready and Müller gave the drawings to a local clockmaker in Darmstadt, with the order to make the machine in metal. The work was taken over by a pair of journeymen in the same trade and on the 20 June 1784, the machine was ready. On 24 June, 1784, the 14-digit calculator (see the upper image) was demonstrated in the Göttingen Academy of Sciences, which appointed Müller as a correspondent. 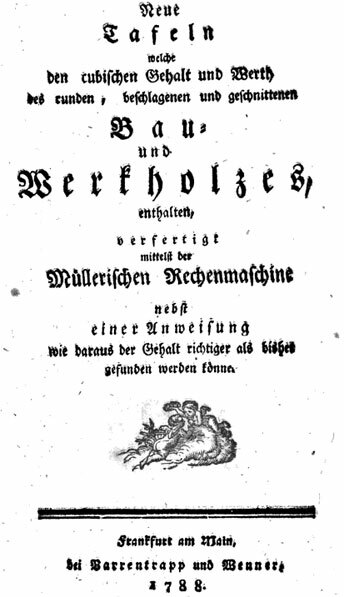 In July 1784 the device was described in the journal Göttingische Anzeigen von gelehrten Sachen (p. 1201-1206), and later in other editions. 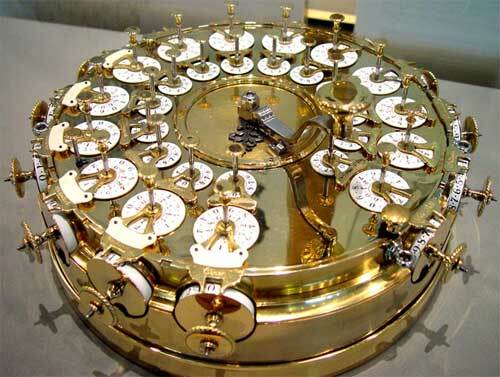 Müller's calculating machine is very similar to the machine of Hahn and was based on the Stepped Drum of Leibniz, but it is larger (285 mm diameter, 95 mm height, weight 15.5 kg). It was in the form of a round box with a handle placed centrally and the number wheels concentrically arranged around the handle. It could calculate with 14 figures and its number and gear wheels could be altered to enable it to operate with non-decimal number systems. 1. Using the buttons (marked with h), we set the first addend in the windows of dials (f), using the black digits. 2. Set the other addend using the side dials (g). 3. Make one revolution of the crank (K). The sum can be read using the black digits in the windows of dials (f). 4. Third, fourth, ... addends can be entered at the side circles (g) and each adding operation is performed using one revolution of the crank. The subtraction can be performed in similar way, but the minuend is set according to the red digits in the windows of dials (f), while the subtrahend is set in the side dials (g). After the rotating if the handle to 1 revolution the result can be seen using red digits in the windows of dials (f). The multiplication can be done by performing successive additions, while the division is done in the way, similar to the multiplication, but are used the red digits of the dials and is based on successive subtractions (just like using the machine oh Hahn). 1. The axes of stepped drums from the Hahn's machine, which are used for entering of the numbers, are not anymore set by pulling upwards (which requires a great precision), but by means of rotating dials, with inscribed digits from 0 to 9 over their periphery. 2. The axes, along with mounted on them pinion-wheels, can be easily changed with pinion-wheels with different number of teeth, which provides a possibility of calculations in different numeral systems. 3. In the mechanism of the machine is included a bell, which rings in case of overflow during the adding or negative result during the subtraction (if the operator tried to subtract a larger number from a smaller one). While still working on his machine, on 22 May 1783, Müller wrote a letter to his schoolmate and friend Georg Christoph Lichtenberg (1742-1799), in which he described his invention and set forth his plans. He intended to make a profit from the machine and informed Lichtenberg about his intention to make another copy of it, as soon as the first one was ready. He also wanted to build a couple of simpler calculating machines for addition and subtraction only and hoped to sell his machines in England and Russia. Later on however the Grand Duke of Hesse-Darmstadt Ludwig I, bought the first machine for 4000 Gulden, and incorporated it in his collection of scientific instruments. P.S. If the calculating machine sells well, I would in the future make a machine, which would simultaneously print in printer's ink on paper any arbitrary arithmetical progression in natural numbers or the units, together with the numbers of the terms and the lines in between and which would halt of its own accord, when the side of the paper was full up. After setting the first figures, all one has to do is to turn a handle and after stopping to turn over the paper or to put another sheet in its place. In this way, a sequence of 60 terms can be delivered in a minute. Admittedly Müller never built a machine of this kind. Instead the idea was further perfected and presented together with his universal calculating machine in a book published in Frankfurt and Mainz in 1786. This 50 page booklet was edited by Müller's friend Philipp Engel Klipstein. It contained, besides an exhaustive description of the mode of operation and design of the constructed machine, also a discussion about its advantages over manual computation and a detailed account of the special security (correction) mechanisms incorporated. Finally, under the heading "Further inventions of superior calculating machines and an arithmetical printing machine" the new machine was presented. In these passages, it is made clear that Müller, perhaps at an even earlier date, had invented a difference engine (capable to operate to the third order of difference) for the rapid production of error-free tables, by means of "whole series of numbers" and by using "difference-numbers" (Differenzzahlen). A description similar to that in the postscript to Lichtenberg is given of the printing part, which was supposed to print directly onto paper, rather than produce matrices for stereotypes. No mention is made of how the necessary mechanisms to accomplish this were to be designed. Nonetheless it is clear from this document that Johann Müller had conceived the idea of a difference engine by the year 1786. Müller indicates that if someone were willing to finance its construction, he was willing to make the machine. He estimated that a table of x3 (1 ≤ x ≤ 100000) could be produced in just over ten days of effort, even if the operator only worked for eight hours per day. 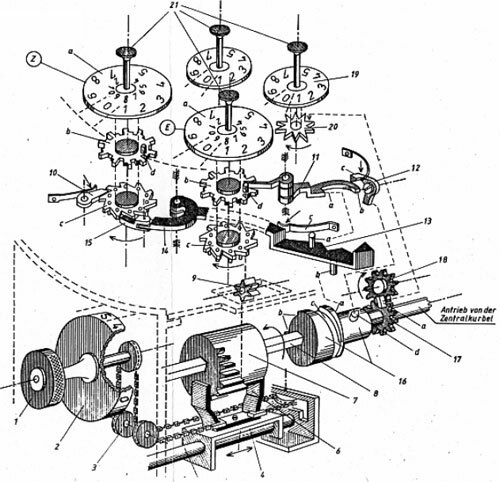 Such a machine will be proposed almost 40 years later by Charles Babbage (see the differential engine of Babbage). It is known that several chapters of the book have been translated for Charles Babbage by his friend John Hershel. However, the date of this translation is unknown and the question remains whether some of Müller's ideas have been used for Babbage's machines.